Mike Zimmer told reporters on Tuesday that the Vikings' highly paid cornerback “needs to play better,” and added he’ll make sure that happens. "We're paying him a lot of money." 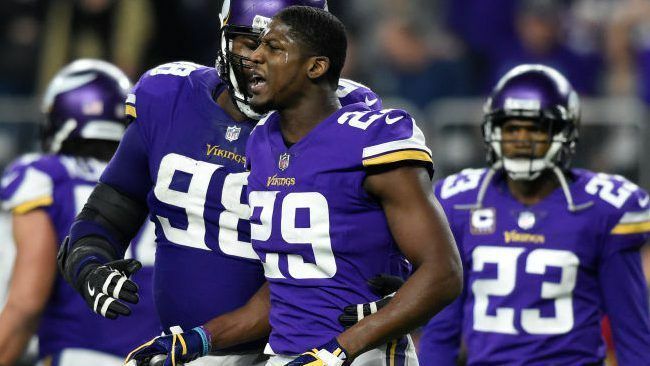 As Xavier Rhodes returns to the Twin Cities next month for the start of offseason workouts, at the beginning of his seventh season with the Vikings, he’ll have some work to do to move beyond a 2018 season that the cornerback said was his hardest in the NFL. Coach Mike Zimmer effectively said as much during the coaches’ breakfast at the NFL owners’ meetings on Tuesday morning, telling reporters in Arizona that Rhodes “needs to play better,” and that he’ll make sure that happens. Rhodes’ $10.4 million base salary for the 2019 season became fully guaranteed on March 15, and he figures to remain one of the keys to the Vikings’ defense at age 29 this season. Zimmer said on Tuesday morning it’s more about Rhodes returning to his proper technique than about any decline in the cornerback’s ability, and the coach’s prodding of the former first-round pick has helped Rhodes reach two Pro Bowls while earning a first-team All-Pro nod in 2017. As it relates to last season, however, it’s difficult to separate Rhodes’ slippage on the field from his struggles to stay healthy. Rhodes battled foot, hamstring and groin injuries all season, missing a pair of home losses against the Saints and Bears and being listed as questionable on the team’s injury report five times. He played only 74 percent of the team’s defensive snaps — down from 90.8 percent in 2017 — as injuries turned his brief in-game absences from an amusing social media meme to a nagging concern. He traded defensive series with Marcus Sherels early in the Vikings’ Dec. 2 loss to the Patriots, playing even after a pregame workout showed his inability to move efficiently because of a hamstring injury that had limited him to a few snaps in practice that week. At the end of the season, Rhodes suggested his attempts to fight through injuries might have been counterproductive at times. Rhodes’ penchant for penalties returned last season — he had six flags accepted against him for 84 yards — and the Vikings will undoubtedly count on him to handle top receivers while being cleaner in coverage this year. But no matter how much players might try to downplay the effect of injuries during the season, there’s often a link between how an injury affects an athlete’s on-field technique and a dropoff in his performance. Any fair accounting of Rhodes’ 2018 season has to consider his health struggles, and any hope of a return to form for him in 2019 likely begins with his ability to avoid the ailments that seemed to thread their way through his most recent year. –Depending on how the draft shakes out for the Vikings on the offensive line, Zimmer said the team could look to move Riley Reiff to guard, as our Andrew Krammer first reported in February. The move, Zimmer said, would likely hinge on whether the Vikings found a guard in the draft they felt could start. The team had former Jaguars interior lineman Tyler Shatley in for a visit last week, and there’s still a chance they could look to sign him. –Zimmer said the Vikings would like to bring in a veteran backup quarterback, but given the team’s lack of cap space, they could look to Kyle Sloter as the No. 2 quarterback. According to a league source, former Rams quarterback Sean Mannion will visit the Vikings this weekend. –The coach defended Anthony Barr in pass coverage, saying the linebacker’s issues against the Rams were related more to Los Angeles’ schematic approach than anything else. He also said the Vikings are “going to try some out-of-the-box things on defense this year;” it’ll be worth watching this spring, and in training camp, to see how much the Vikings could alter their approach, ostensibly in response to the schemes from teams like the Rams and Bears that gave them trouble last season. –The Vikings clearly have high expectations for what assistant head coach Gary Kubiak and his associates can bring to the offense this season, and Zimmer said a conversation with 49ers coach Kyle Shanahan — who coached Kirk Cousins in the same scheme in Washington — furthered that belief. “This offense with Kubiak is going to be really good for [Cousins],” Zimmer said. The work Cousins did in the Redskins’ offense (with Shanahan and Sean McVay) formed the resume the Vikings considered when they decided to give the quarterback a fully-guaranteed $84 million contract last year. It’s seemed this offseason that they plan to tailor much of their offense to what Cousins has done in the past — in other words, what Kubiak learned under Mike Shanahan in Denver and implemented with Kyle Shanahan working for him in Houston. It makes good sense for the Vikings to build their offense around that which is comfortable for their franchise quarterback (though it should also be noted how frequently Cousins played behind a sturdy offensive line in Washington). But when coaching additions aren’t subject to salary cap limitations, perhaps the investment in Kubiak, his son Klint, offensive line coach Rick Dennison and tight ends coach Brian Pariani is one of the more sensible upgrades the Vikings could make to their offense.